In today’s 24-hour coverage by cable and internet news media, keeping abreast with current events has become more convenient than ever, but has the increased quantity of news come at the expense of quality? The ubiquitous nature of news as a product of technological innovation has created a fierce competition among media outlets. Cable news networks such as FoxNews, CNN, and MSNBC compete daily to increase their market share of a limited number of viewers. In this market of perfect or almost perfect substitutes, the logical option to beating your competitors would be to try as much as possible to differentiate your product from the rest of the field, and this is exactly what cable news networks engage in. A favorite strategy of networks in distinguishing their products is to rely on the over-the-top personalities of their journalists. As a consequence, we have seen a gradual shift of importance away from the news and towards the newscaster, as the voices of Glenn Beck, Bill O’Reilly, Mike Huckabee, Rachel Maddow, Keith Olbermann, Lou Dobbs, and many others work to define a particular station’s unique image. The assumption underlying this trend is that news on its own is not enough to attract viewers; therefore, networks compensate for the dull news with flamboyant hosts (and extreme guests) who do extended opinion shows on the events of the day. The conundrum is that as one network becomes more entertaining, the others have to scramble to catch up if they want to avoid being left in the dust. So far, the three major networks have all done their share to stay competitive, but what has been left in the dust is the news they were originally intended to report. A recent study done by the WorldPublicOpinion.org found that, while there is a significant number of misinformed viewers of all cable news outlets, FoxNews viewers are the most likely to be misinformed about objective facts in current affairs. 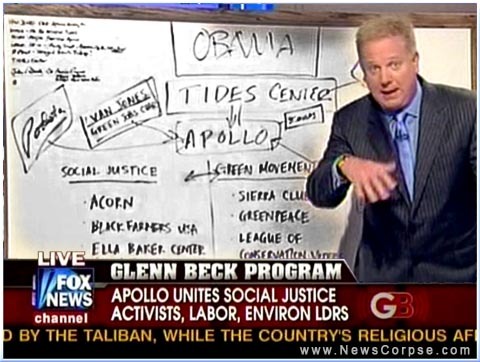 This may come as no surprise however, as the industry incentives to sensationalize have, for example, frequently led FoxNews’ primetime pundit Glenn Beck to turn world news into entertaining puppet shows for his audiences to enjoy. And puppet shows are not even the end of the story. Some viewers have even turned exclusively to Comedy Central’s Colbert Report or The Daily Show for their portion of the day’s news. For cable news, the race to entertain viewers has led to a race to the bottom in factual reporting. In order for a network to be competitive, it has to have its own brand of radical anchors that cater to a specific and ever-more partisan audience. The result has been the creation of a perpetually polarized atmosphere and an uneducated viewership. Only time will tell if the demand for entertainment news programs will continue or if viewers will become disillusioned and seek alternative or additional sources for news, hundreds of which are already available online.